Power is founded on property. Few people nowadays would deny this doctrine. The political philosopher James Harrington formulated it in the mid-seventeenth century. Living in per-industrial England he still considered land, not money, the most important form of property. The social group that held most of the country’s land also held the largest amount of power. In early modern England this was the monarch and his nobility, including the bishops. However, from the reign of Henry VII onwards, and especially through the Reformation and the dissolution of the monasteries and sale of Church lands, power relations began to change. Over time, the King (or Queen) and nobility lost land and power in favour of the next social group, the gentry and the commoners, represented in the lower house of Parliament. By the early Stuart period the power balance had been upset so badly that struggles between the King and the House of Commons led to a breakdown or ‘dissolution’ of the government in the English Civil War. Anyone trying to reconstruct the English government in the aftermath of the war would therefore have to create a new superstructure that took into account the changed power relations. 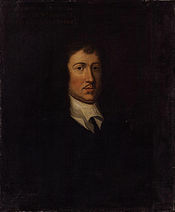 The most famous elaboration of Harrington’s theory can be found in his utopian Commonwealth of Oceana of 1656, in which he tried to persuade Oliver Cromwell to play the sole legislator, set up the perfect republican state and retire to the country. ‘Good laws’, Harrington believed, could give the country stability, and these laws had to be infallible, so that bad men would not be able to corrupt the state. Harrington never saw his dream come true. The Restoration of the Stuarts in 1660 meant a return of many of the old problems. But his ideas of mixed government and a balance of power remained influential in the writings of the Neo-Harringtonians of the later 17th and early 18th century. They influenced both the American and French Revolutions, while his materialist theory of political change would also strike a chord with Marxists and modern economic and political thinkers. James Harrington would have celebrated his 400th birthday today. He was born in Upton, Northamptonshire on 3 January 1611 and died in Little Ambry on 11 September 1677. In his book on The Hebrew Republic, Eric Nelson sets out to refute the commonly held assumption in early modern historiography that political science came to be separated from religion over the course of the seventeenth century. Instead, he argues that the concept of the respublica Hebraeica was seen as authoritative by many political thinkers, and that in particular three elements of God’s commonwealth were influential: the republican form of government, the redistribution of property by means of agrarian laws, and religious toleration. In their pursuit of the ideal government, seventeenth-century authors did not just rely on the authority of the Bible, but also on the works of the rabbinic tradition. In the three chapters that constitute the main body of his book, Nelson then goes on to prove each of his points in turn. First, he argues that republican authors came to consider popular government as the only legitimate form of government instead of seeing it as one possible form only. Secondly, Nelson shows that republican authors, most famously James Harrington, came to put more emphasis on the necessity for a redistribution of property by means of agrarian laws influenced by rabbinic scholarship. And finally, he shows that the pursuit of toleration, usually attributed to a process of secularization which involves a separation of state and church, was perfectly compatible with an Erastian church, i.e. a church under government control. For in God’s commonwealth, Nelson argues, there was no separation between the religious and civil spheres, and God gave his laws to the secular ruler. If you want to buy Nelson’s argument or not, you have to admit it is well put. His work is clearly structured, the prose flows well, and the book is so highly readable that you don’t want to put it down. A must for everybody interested in early modern religion and political thought. Eric Nelson, The Hebrew Republic: Jewish Sources and the Transformation of European Political Thought (Cambridge, Mass. : Harvard University Press, 2010).